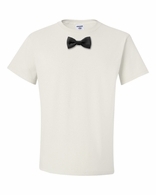 Ahh, the classic Tuxedo T-shirt. What better way to mix a formal look with absolute comfort. 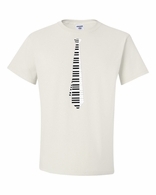 You can wear it as a gag at a semi-formal party. You might even be able to pull it off with a blazer at a wedding (just be prepared to possibly hear it from the bride!). 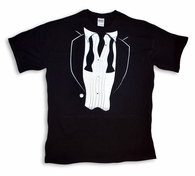 Some of our Tuxedo T-shirts also come in long-sleeved, crewneck or hooded styles. We even have a couple of options for the ladies who want to try a theme at their next girl�s night out or bachelorette party. 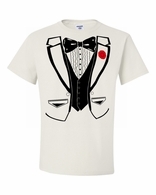 Fill your cart with all the Tuxedo tees you want and enjoy $5 standard shipping to destinations in the United States. 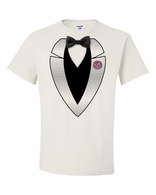 Tuxedo t-shirts have always been a huge seller - get that formal look without much effort - throw a sports coat over the top and you really step up this Tuxedo tee look. 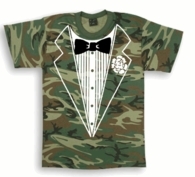 We even offer the tuxedo design on a camo t-shirt. Perfect for those chicken and beer dances. 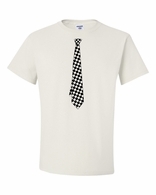 You'll always find the highest quality Tuxedo T-Shirts when you shop at TShirtHub.com.